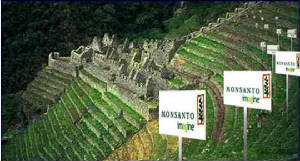 to plant them in another field because those seeds are somebody´s “intellectual property”. Can you imagine the shame of having those signs in our land? Maybe in Cuzco? lasted many years, which included text, images and sabotaged videos from www.monsanto.com. office- filled by Monsanto to request the patent of corn DNA in 2004. The last paragraph of the email reads: I dedicate this photo to Monsanto and its lobbyist in Peruvian government, congratulations and…good apetite! I silkscreened that email on the inside panels of unfolded Kellogg´s corn flakes boxes -a prominent brand, known to contain Monsanto´s patented, genetically modified corn-. The exterior package design of the corn flakes box remains unaltered.